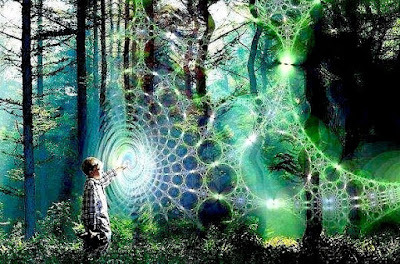 Quantum theory is mankind's most successful mathematical connection with Nature. But after more than one hundred years of immense conceptual and technological success, it seems to possess at least one fundamental flaw. Despite the fact that we know that the world works by purely quantum rules, our only access to this world (so far) is via completely classical measurements. The goal of quantum tantra is to open up new doorways into Nature, new connections that are intrinsically quantum not classical, that are deep, direct and intimate and that probably have more to do with consciousness than with unconscious measuring instruments. "We'd rather be reading our meters." One possible realization of quantum tantra is that I learn to experience the physical world in a manner analogous to the way that I experience my own body. A new kind of mind-merge with matter made possible by our radical understanding of how things really work. I envision this new learning to be augmented by some sort of quantum-inspired technology which I have called a Convivium. Or sometimes an Octoscope. Since physics is a more fundamental science then chemistry for exploring deep reality, with all honor and respect, I consider psychedelic drugs as mere training wheels compared to quantum tantra. But as a pragmatic explorer I realize you gotta use what you got. While waiting for my Physics Muse to deliver me a Convivium or Octoscope, my most immediate way to prepare for direct entry into the quantum world appears to be expanding my awareness of this physical body that daily carries me about in the world. 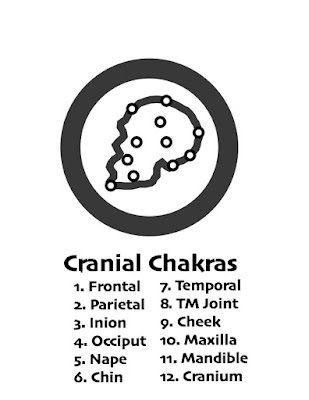 So for many years, I have been carrying out a Chakra Project to expand the number of body centers into which I could place my awareness -- the main hypothesis being that a body part to which I direct my attention is in some way essentially different (in a quantum way?) from a body part that I leave unattended. 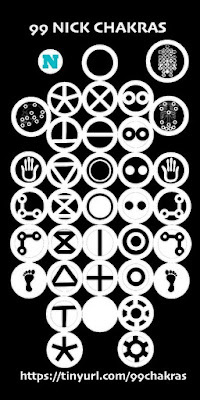 I began with the Seven Classical Hindu Chakras, extended this number to Twenty-Four, then Twenty-Seven, then Eighty-Four. 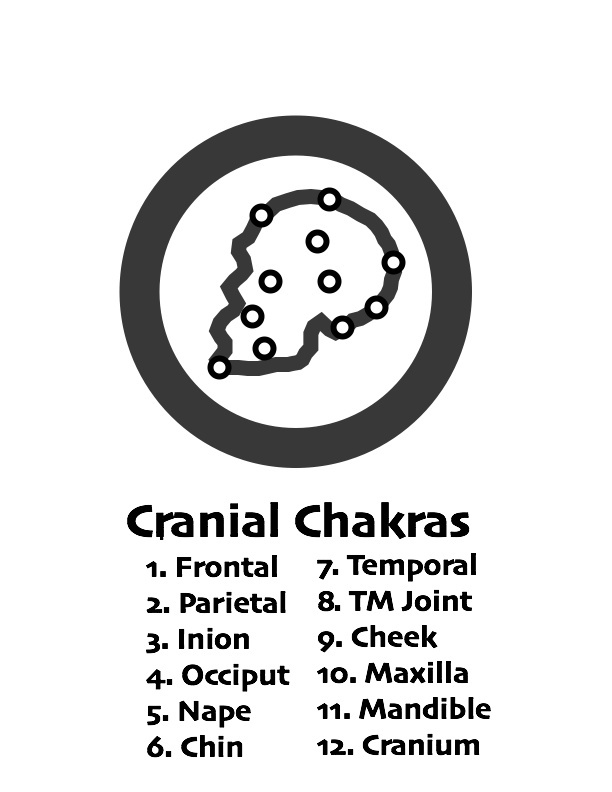 Then finally to the Ninety-Nine Nick Chakras illustrated above. 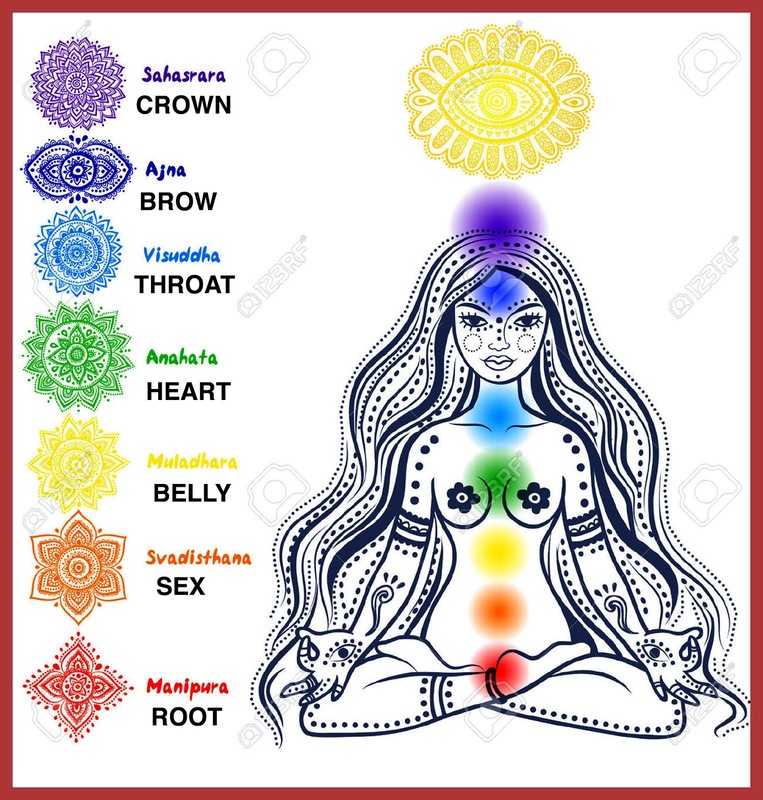 I have used this new chakra system in various ways, from systematically expanding my bodily awareness, to reciting a kind of bodily Rosary, to preparing my body for massage, to falling asleep at night by counting chakras instead of sheep. For exploring a new territory, it's useful to have a good map. But once you're there you can toss the maps away. Follow your own interests and curiosity. 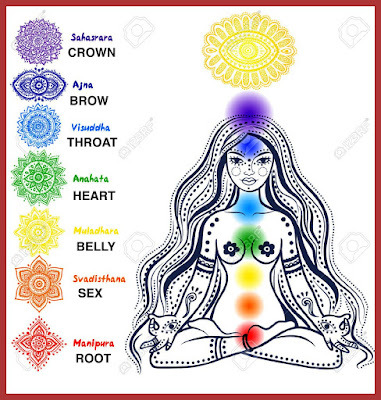 Besides the chakras, I've found many other good maps for exploring the body's wonders based on your particular training and interest. Being mainly a bookish person, I'm not much interested in sports, but loved ocean swimming and had been a fairly good tennis player at the City Park level. For more than twenty years I have been working with weights under the direction of a world-class power lifter, ex-Marine and ex-police officer. So far, all without books. But then I discovered Frederic Delavier's Strength Training Anatomy. Delavier is both a trained artist (five years at the Ecole des Beaux Arts, Paris) and a champion power lifter (best in France 1988). 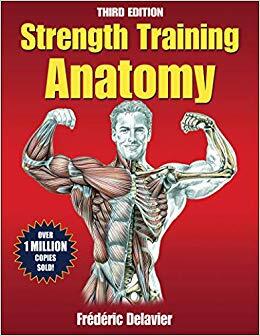 His book spends a few pages on every classic lift, and illustrates with simple color-coded drawings exactly which muscles you are utilizing for that lift. (You can confirm Delavier's insights by what parts hurt the next day.) He also includes sections on stretches for relaxing parts of the body that have been tightened by serious exercise and illustrates which muscles are involved in each stretch. Here is a video review of Delavier's wonderful book by an admiring body builder. For the last couple of years I have been enjoying monthly massages from a lovely Buddhist masseuse who lives at Vajrapani Institute, our local Tibetan Buddhist retreat center. Her body work combines sensitive attention plus exercises in visualizing each moment as Empty, Impermanent, yet paradoxically infused with Compassion. 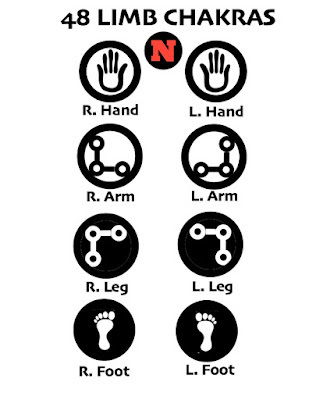 These massage sessions got me interested in yet another book (another set of body maps). Andrew Biel's Trail Guide to the Body is the premier source for intelligent palpation. Both the author and the illustrator Robin Dorn are licensed massage practitioners. The trail guide metaphor is useful and witty: for example, the trip round the elbow is called "exploring Knob Hill". Dorn's skillful drawings have just enough detail to be useful yet uncluttered. 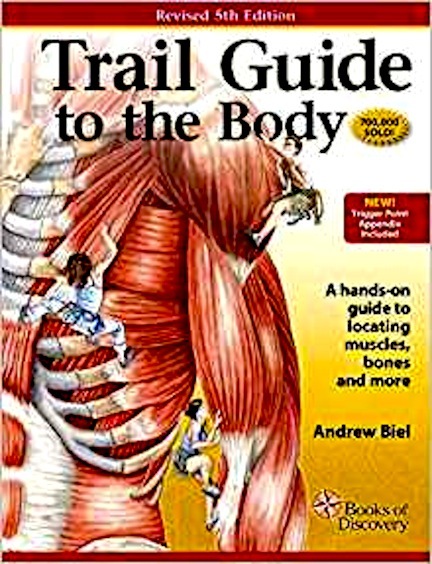 You could spend a lifetime exploring your body or someone else's using this nearly 500-page book as a map. 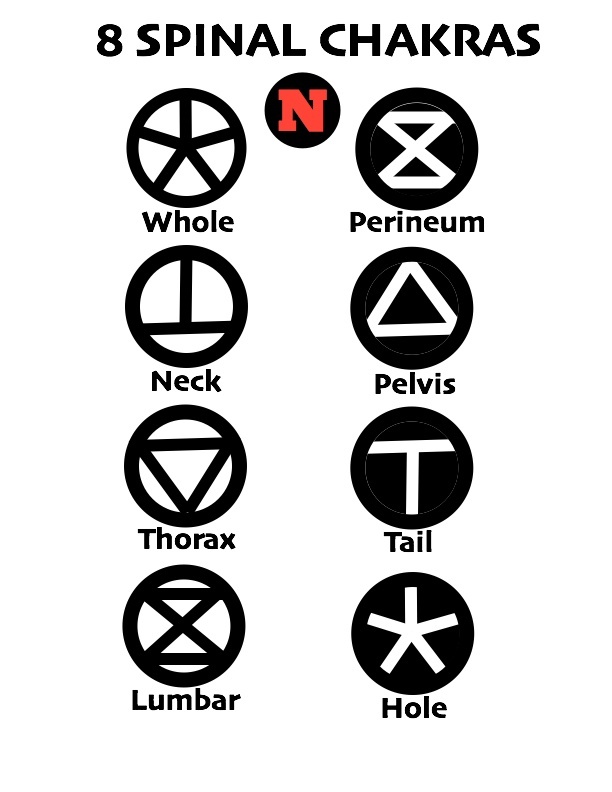 I'm currently involved in trying to confidently palpate the eight carpal bones at the base of my hand. Here's a video interview with the author who among other things describes his favorite muscle. Hint: it's a muscle you've never heard of. Although I play jigs and reels in an Irish session band, I'm not really much of a dancer. The nearest I got to serious dancing was studying Aikido with Linda Holiday in Santa Cruz. 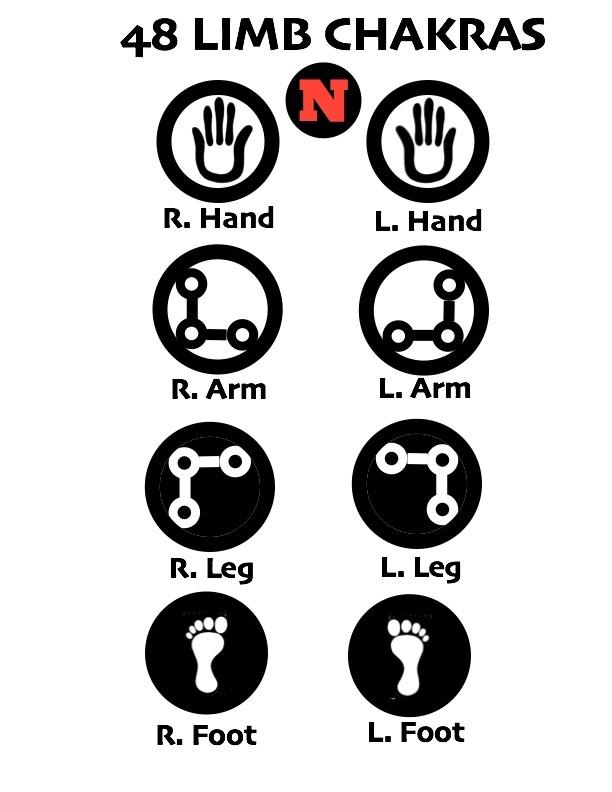 Throwing and being thrown in many different ways by many different kinds of bodies brought me very much in touch with what being embodied actually felt like both in and out of Linda's dojo. I was also married for more than thirty years to Betsy Rasumny, a talented improv dancer who taught and performed in New York, Montreal, San Francisco and Santa Cruz. For me, one of Betsy's finest teachings was that, for someone who is fully present, every movement can become a dance. My wife was an expert at being fully present. Among the many gifts Betsy left me after her death in 2002 was this book on body maps for dancers. Andrea Olsen's BodyStories: A Guide to Experiential Anatomy is exactly what it claims to be -- a guide to actually feeling what it's like to be present in your own particular body. There are pictures of bones and muscles but accompanied with children's drawings and other art work designed to invoke the strange unspeakable mood of this particular kind of embodiment. In her dedication, Andrea Olsen states that the function of this book is not to demystify the body -- but to help embody the mystery. 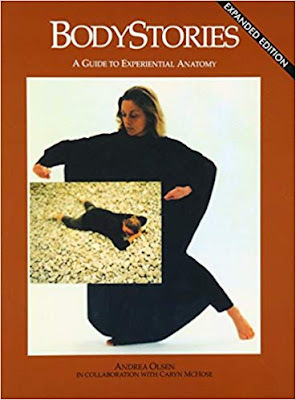 Designed for dancers, this book contains movement and palpation exercises both alone and with a partner and is peppered with short anecdotes (body stories) from Olsen's long career as a teacher and performer. 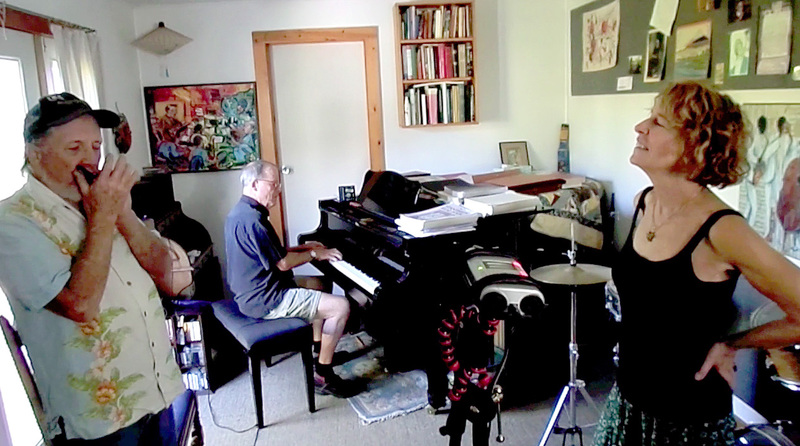 Here is a video of Andrea Olsen giving a TED talk/performance in Monterey, CA. Is this woman embodied or what? 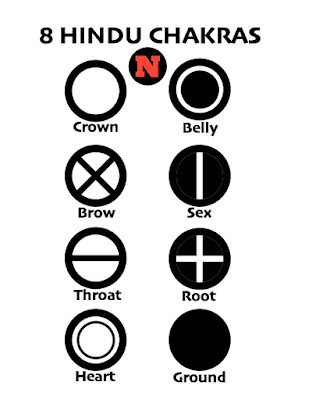 One version of quantum tantra would be experiential anatomy on quantum steroids. 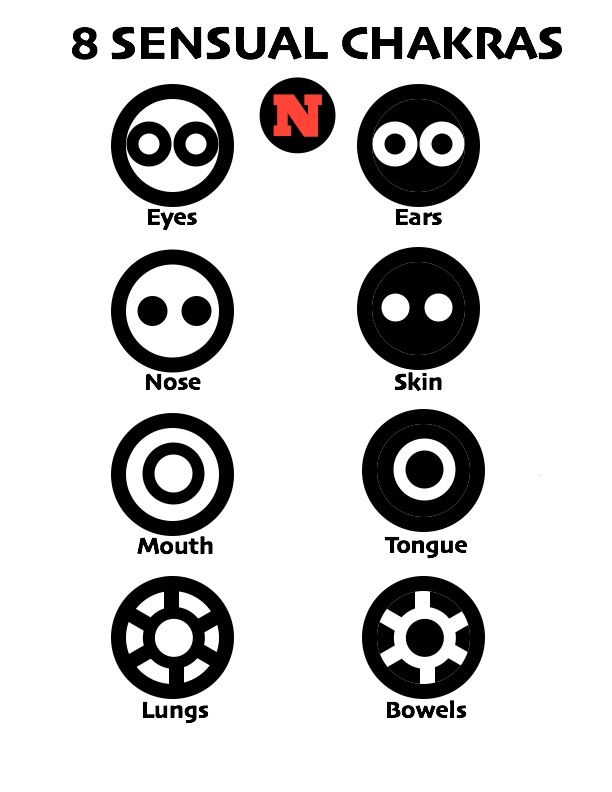 The octoscope (or convivium) would open up our universe to non-classical modes of inquiry, to brand new experiences of the physical body not to mention new experiences of the physical world, providing strange new openings into reality entirely unavailable to our species before the discovery of quantum theory. Nature unlocks Her darkness and welcomes us in. 1963 was a big year for me. I had passed all my exams at Stanford and was beginning my thesis work under Walter Meyerhof using a small particle accelerator in the basement of the Physics building. With some lady friends from the Psychology department, I had just experienced my first acid trip which opened up for me new worlds of possibility. In this excitable mood I decided to spend my Christmas in Mexico, packed my gear into a big duffel bag and hopped a bus down to Guadalajara. Where I met a fellow American named Dave Whitaker, who was married to an anthropologist in Wisconsin, and was, like myself, looking for adventure. Both of us were bearded and scruffy and attracted a lot of attention. Since 1963 predated the hippies, we were called "existentialistas" or sometimes "Fidelistas". In Mexico City we met several young men from the University who were eager to practice their English and wanted to show us the hot spots. Dave & I lived in a hotel a few blocks from the Paseo Reforma park right in the center of the city, within walking distance of the Metropolitan Cathedral and several other famous landmarks. 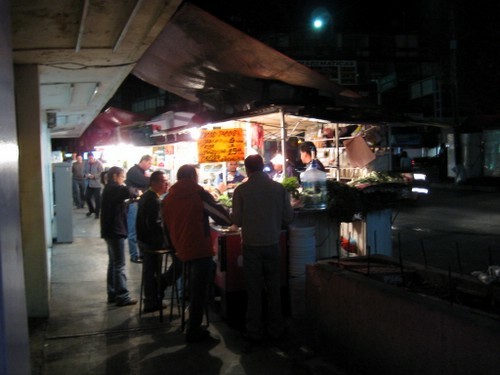 We had been warned not to drink the water so we subsisted on beer and food we bought from the ubiquitous street vendors. At one of these stands, I was served slices of goat cut right off the animal and stuffed into a big tortilla. One day Dave and I decided to see the ocean and took a bus to Mazatlan where for the first time I was able to swim in ocean water as warm as a bathtub. The Mazatlan beach is crowded with expensive hotels, but behind the hotels sits a typical Mexican village. We stopped in a cantina and immediately became the center of attention. At a table inside, four Mexicans invited us gringos to play a drinking game. They produced a "shock box" made of a lantern battery, an automotive spark coil and a rheostat for controlling the voltage. I had played with such devices in my physics class in high school and knew how they worked. In this cantina game, you would hold a tin can in each hand and see how much voltage you could endure. The loser buys beer for everyone. This game was a nice way to interact with good-hearted guys who didn't speak your language. And after buying three or four rounds of beer for the Mexicans, we gringos shook hands with the winners, happily took our leave and traveled back home to Mexico City. Pulque is a peculiar Mexican beer brewed from the agave cactus and sold only in special bars called pulquerias. Pulque is the color of milk and is known as the drink of the working class. As luck would have it, there was a pulqueria right across the street from our hotel. Each of us dared the other to try this exotic brew and I would taunt Dave by calling him Señor Pulque in hopes that he would try it first. That never happened. 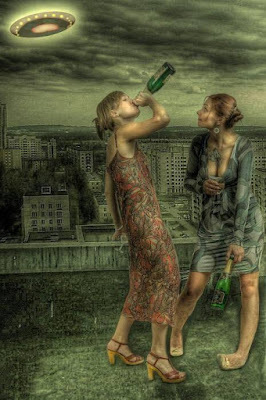 And I am still ignorant of the taste of this working-class brew, a situation I very much regret. Dave did introduce me to another exotic substance -- not pulque but "speed". As that time you could go to any pharmacia and buy Dexadrine in various forms without a prescription. (Even though every bottle was clearly labeled "Not for sale without a prescription".) I loved speed. It made me feel as super smart and as fearless as I knew I really was. And I could stay up and party all night. "This is a drug I could get addicted to," I said. But unlike acid, which seems to give you insights into the nature of consciousness, the speed high is completely empty, a mere revving of the engine of ordinary awareness. And when the drug wears off, the downside is horrible -- like somebody has been using your body for weeks. 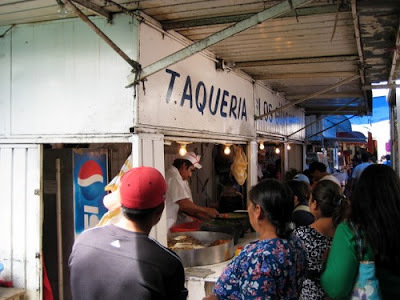 After this brief experience in the streets of Mexico City, I said goodbye to amphetamines as a future drug of abuse. 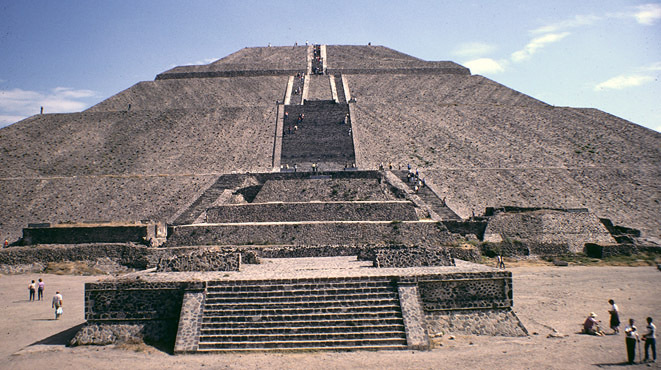 While Dave was busy with something else, I decided to take a trip to one of Mexico's most famous archeological sites -- Tenochtitlan, the Temple of the Sun, which is located a few miles north-east of Mexico city. I rode a bus, complete with people carrying live chickens, to the site, ignored the little kids trying to sell me "authentic" clay figurines, wandered around the various buildings and then decided to climb to the top of the Sun Temple. I was almost to the top and flanked by two women, when one of them turned to me and asked me one of the strangest questions I have ever heard. "Did you know," she asked, "that this temple was built by Jews?" Actually I didn't know that. But I was informed by the two women, who happened to be Mormon archeologists, of their belief that one of the Lost Tribes of Israel had sailed to the New World and founded new civilizations of which the Temple of the Sun was one part. Since I was a mere physicist I could come up with no facts to refute their claim so I listened intently to their story. And eventually after reaching the top of the Temple, the women led me down, across the yellow tape, to meet their Mormon colleagues who were busy excavating some new walls covered with paintings of jaguars and other exotic ancient Jewish iconography. Later, after my trip to Tenochtitlan, Dave and I were walking in Mexico City with a bunch of locals who were testing out their English (which was much better than our Spanish) when we ran across a guy in a vacant lot who was selling marijuana. I was curious because I had never tried this substance but one of the Mexicans warned us: "Don't try that stuff. It make you crazy. Let's go get drunk instead." Ignoring his warning I bought a bag of it to take back to our hotel. Most of the Mexicans left but two followed us back. Our room was on the third floor with a window facing the main street. And to make the scene complete, a neon sign outside our window was flashing lurid colors across the bed. We rolled the stash up into a big cigar using a page from a Mexican newspaper and passed it around. The two Mexicans were lying on the bed and Dave and I were sitting on the floor. The neon light was flashing off and on. It looked like a typical sordid drug scene you might see in the movies. It was my very first time smoking marijuana. Dave and I both saw spiders. Big spiders crawling all over the ceiling and across the walls. But they were comical spiders like something from a Disney cartoon. 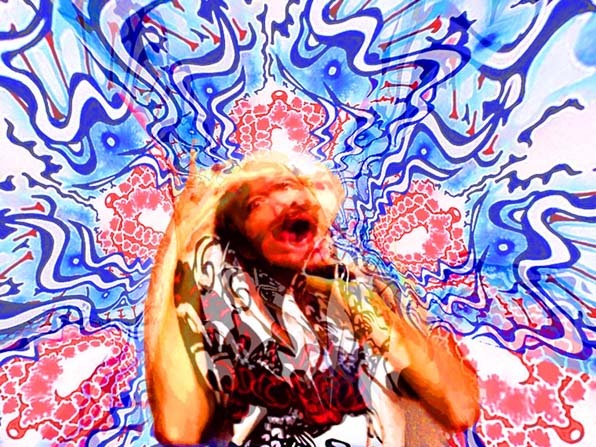 We burst into laughter at this shared hallucination. There were spiders running all over our room. And they were really very very funny. Meanwhile the Mexicans on the bed seemed to be having a bad trip. 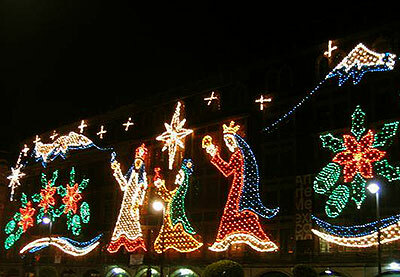 They had stopped speaking English and were screaming in their own language about Jesus, Mary and Joseph. Perhaps they were having a religious experience but it seemed not to be a pleasant one. Perhaps they had "gone crazy" as their comrade had suggested might happen with this loco weed we bought in the street. We had no chance to assess their condition because as soon as they calmed down sufficiently, they ran out the door and we never saw them again. These days, most people interested in experimenting with drugs start out with marijuana and graduate to the "harder stuff" but for me it was just the opposite, For Nick Herbert, on Christmas Eve 1963, in Mexico City, for better or for worse, LSD became a gateway drug to marijuana. Brand new kinds of play? As a step on the Way? And told me her first sexual experience. With a "bad boy" in school named Nick. "How far did you two go?" and listened to animal noises. "Holding hands in the dark? Is that all you two did together?" And let me tell you, sister. Like the interpenetration of galaxies. Each moment's birth is a new birth of me. Quantum Tantra Blog is now 10 years old. 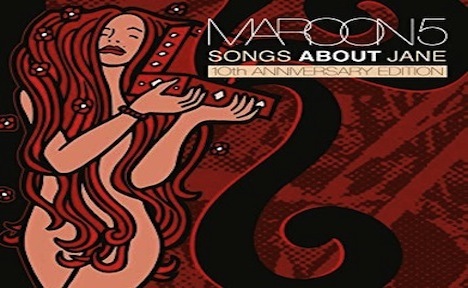 Happy Birthday, old friend! During its life QTB has published 495 posts which have received more than 500,000 views. The blog is mainly a kind of diary of the major concerns and accomplishments of Nick Herbert and his alter ego Doctor Jabir 'abd al-Khaliq. 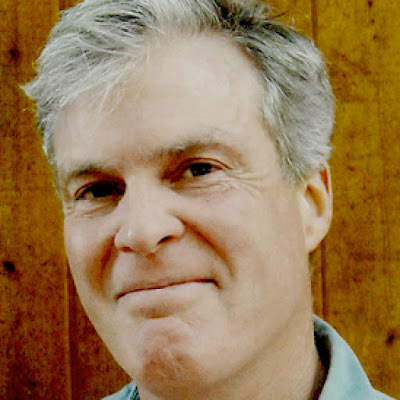 Nick's primary goal is to father a brand new physics (Quantum Tantra) which will connect us all with Nature in a more direct and intimate way. This quest has generated dozens of pages of quirky quantum tantric poetry but no concrete physical results as yet. But I continue to pursue this "impossible dream". The quest begins with quantum mechanics, the most successful theory of the physical world ever devised, which comes at the price of physicists not knowing what this theory actually means: the "quantum reality problem" -- about which I wrote my first book Quantum Reality: Beyond the New Physics. 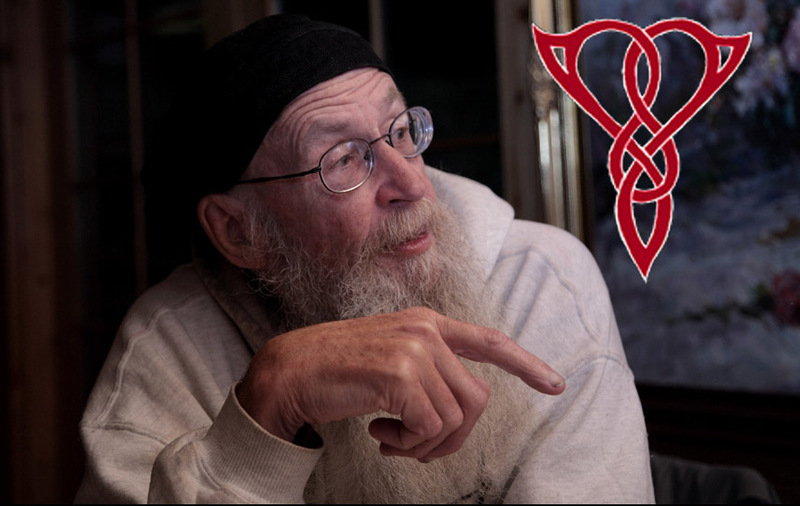 One of the important milestones in quantum reality research is Bell's Theorem in which Irish physicist John Stewart Bell proved that although the quantum facts are everywhere "local", the quantum reality underlying these fact must be "non-local". 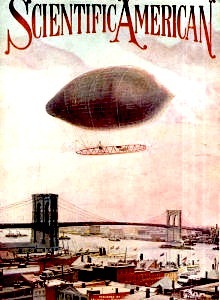 The term "non-local" essentially means "faster-than-light", which Albert Einstein declared verboten in physics. But, in a truly peculiar twist of logic, Bell's faster-than-light proof applies only to REALITY not to the FACTS. Einstein's prohibition still holds for the world we can see; only the invisible reality behind these facts must be faster-than-light. Bell's Theorem has led to many clever attempts to move FTL REALITY into FTL FACT. One of my hobbies is superluminal signaling schemes, many of which are described in my book Faster-Than-Light: Superluminal Loophole in Physics and in quite a few of my QTB blog posts. 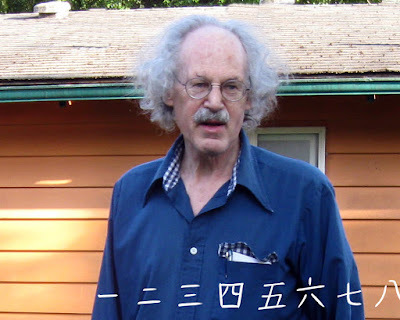 In fact, exactly ten years ago, as I was just beginning this blog, I had just published, in the physics arXiv, a FTL communication scheme called ETCALLHOME which was refuted within 24 hours by Israeli physicist Lev Vaidman. The most exciting FTL scheme reported in QTB was the KISS proposal of Demetrios Kalamidas which uses a kind of "fake news" effect to exploit quantum path entanglement to send superluminal signals. Six prominent physicists, including one of Kalamidas's former optics professors, were involved in KISS's eventual refutation. The refutation by Wooters and Zurek of one of my own FTL schemes, called FLASH, led directly to the quantum no-cloning rule, a result important in the field of quantum computing since it proves that, unlike classical information, such as a jpg of your cat, which can be exactly copied, perfect cloning of quantum information violates the laws of Nature. 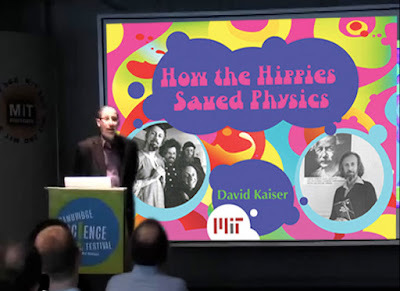 The story of the discovery of the no-cloning rule is the centerpiece of David Kaiser's recent book How the Hippies Saved Physics which also recounts the adventures of some of my disreputable physics friends. David Kaiser and some hippies who "saved physics"
Kaiser describes the Esalen Seminars on the Nature of Reality, hosted by myself and eccentric mathematician Saul-Paul Sirag, where for eight years prominent physicists were invited to discuss Bell's Theorem along the Big Sur cliffs and in the Esalen sulfur baths. 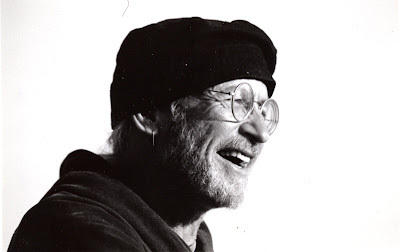 Through the good graces of Fed Ex philanthropist Charles Brandon we were able to award, in Esalen's Big House, the Reality Prize to John Bell (theory) and John Clauser (experiment) for their decisive demonstration of quantum reality's necessary non-locality, possibly the first time these guys's important achievements were publicly recognized. Also in QTB, I describe my collaboration with Saul-Paul Sirag in elucidating the nature of the Sirag Numbers, a sequence of integers indirectly related to the quantum theory of angular momentum. 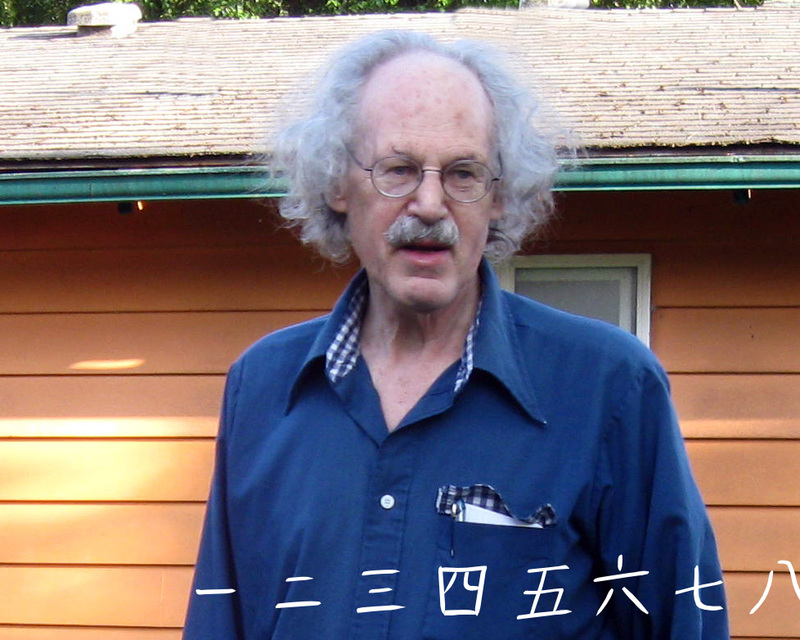 Later, I give a brief biography of Saul-Paul (who was born in a concentration camp) as preface to a review of his new math book ADEX Theory: How the ADE Coxeter Graphs Unify Mathematics and Physics. 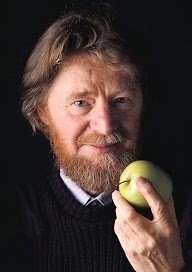 In 2014, the city of Belfast celebrated the 50th anniversary of Bell's Theorem by naming a street in its Titanic district after his theorem and by hosting a museum exhibit of works of art inspired by Belfast-born John Bell. 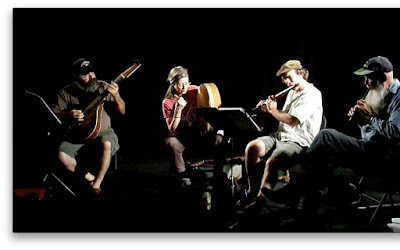 My song Bell's Theorem Blues was chosen as one of the exhibits and was performed by local (Boulder Creek) vocalist Joy Rush, pianist Jack Bowers with George Galt on harmonica. The festival could not afford to pay our fares to Ireland but you can listen to the recording we sent and read the lyrics here. 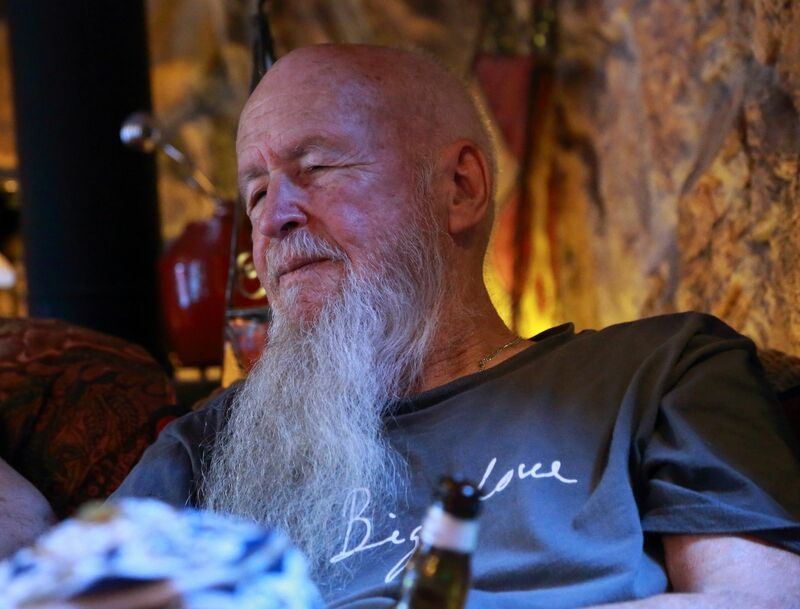 In this blog I also recall my two meetings with John Stewart Bell at the home of Stanford physics professor Pierre Noyes. 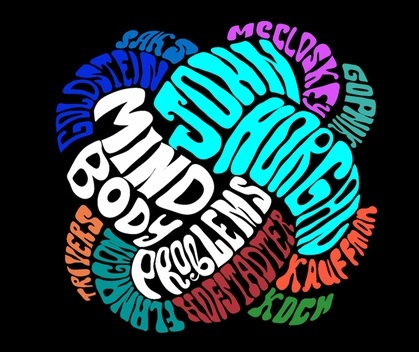 In the spirit of our old quantum physics seminars, Esalen has been hosting invitational meetings on the more general topic of human Superpowers, initiated by one of its founders Michael Murphy and expanded by extraordinary religious scholar Jeffrey Kripal. Most of these superpowers are considered IMPOSSIBLE so they thought it might be fun to have a few physicists on board. I was invited to two of these seminars including one devoted to the extraordinary levitations of St Joseph of Copertino, chronicled in the recent book by Michael Grosso The Man Who Could Fly. This seminar inspired my own levitation project, a subset of my quantum tantra urge to learn to relate to Nature in radical new ways. As part of my project to relate to Nature in brand new ways, I invented the Metaphase Typewriter, a quantum-random putative mechanical spirit medium. In common with all of Nick's efforts so far, this project seemed to utterly fail. But recently the Metaphase Typewriter was revived as an art project by Lynden Stone in Queensland, Australia and by Dmitry Morosov in Moscow. While Nick was waiting for the Messiah to come (a play on the name of the wonderful picture book about Esalen by Bernie Gunther : What to Do Till the Messiah Comes), he fell in with a bunch of rowdy Irish musicians in Santa Cruz, learned to play the Irish whistle, and became part of a band called Blarney which plays at private parties and (a few times) on stage. My biggest achievement as member of the wonderful Blarney band was the composition of a patter song, 32 Irish County Jig, that recites each of Ireland's 32 counties. I am really surprised that no one else had ever done this before. Then there is my poetry ("the kiss of death" according to my literary agent John Brockman). In Boulder Creek, for a dozen or so years, there arose a remarkably fertile poetry movement, which I call the Bistroscene after Conrad Santos's Boulder Creek Bistro where a majority of the action took place and where I premiered my quantum tantric poems and many others. Many of these performances were videoed by Alan and Sun Lundell (aka Dr and Mrs Future) and are still being rediscovered as Al and Sun transfer their ancient video formats to archival hard drive. Regarding weird literary output, it would be impossible to ignore my friend Rudy Rucker, the Lawrence Ferlinghetti of cyberspace. Rudy conceived and published Flurb, an online magazine of radically trippy inventions, including some of my own stuff and the most imaginative alien psychedelic I have even encountered -- James Worrad's Eye-High. I devised a new proof that classical and quantum ESP powers must be precisely equal: Nick's Proof. 2: Does Consciousness Create Reality? Many thanks to all my viewers. Happy 10th Birthday, dear Quantum Tantra Blog! so cruel and full of malice. Have you made your mind a pleasure dome? Have you adorned yourself as ready bridegroom? offering your golden body/mind at bargain rate? And they want us to marry their sisters too. 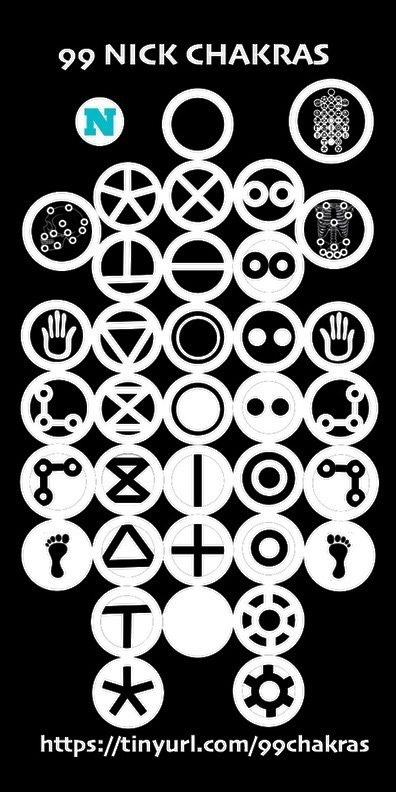 to Earth's uniquely beautiful males and females. They've made the first move. They've touched us gently so as not to frighten. In the flower-filled back garden of Conrad Santos's Boulder Creek Bistro, Dutch entrepreneur and TV producer Luc Sala interviews visionary physicist Nick Herbert concerning mind, matter and quantum tantra for Luc's KleurNet Channel in Amsterdam. Videoed by local media wizard Allan Lundell (now operating as Dr Future), Luc's interview succinctly captures the gist of Nick's dream of a new sensual science in a mere thirty minutes. The best TV interview of Nick ever, on his home turf. All killer. No filler. This month marks the 10th anniversary of Quantum Tantra blog for which I will soon be publishing a retrospective. But as I was reviewing dozens of exciting projects reported here, one event shone out in my mind, the day I was standing in my friend Reno's driveway overcome by intellectual ecstasy: I had calculated a way to send signals faster-than-light (FTL). My thrill lasted only a few hours till a friend found an error in my calculation. This particular FTL mind high was instigated by Demetrios Kalamidas, a Greek-American physicist, now employed by Raith Nanofabrication, who had recently published in an optics journal a particularly ingenious FTL communication scheme. The quest to refute Kalamidas's proposal was for me a particularly fine adventure: my brief ecstasy in Reno's parking lot was the result of calculating my own refinement of the Kalamidas effect; and it was Demetrios himself who pointed out my math mistake. I called the Kalamidas proposal KISS (for Kalamidas's Instant Signaling Scheme) and documented the struggle to refute this scheme in six blog posts. A seventh post: 7. Some Notes on Quantum Entanglement provides useful background material for understanding FTL proposals of the Kalamidas kind. When DK put forth his proposal, it attracted the attention of three prominent physicists, GianCarlo Ghiraldi (Trieste), John Howell (Rochester) and Christopher Gerry (CUNY), one of DK's former teachers, who each quickly came up with three different but quite solid refutations. These three separate refutations should have put an end to the Kalamidas affair, but the feisty Greek came back fighting. Since you know I am wrong, Demetrios replied, it should be "easy pickins" for you to point out my specific mistake. General proofs are fine, but the devil is in the details. Show me that devil, Kalamidas challenged his critics. The first detailed calculation of the Kalamidas effect was due to Martin Suda at the Technical University of Vienna followed by a similar calculation by Nick Herbert from Boulder Creek. Both of us showed why KISS wouldn't work but the physical meaning of some of the terms in our calculations were difficult for us to understand. But after much conversation, these difficulties were eventually resolved. And that was the end of the KISS affair. Or was it? One of the features of the Kalamidas proposal is its extreme cleverness, a feature, that in my opinion, has been insufficiently recognized and appreciated. I intend in this post to briefly explain the Kalamidas effect, and to show off its beauty by placing it in a more familiar context than the physics of photons. Modern FTL communication schemes conventionally involve two QUANTUM-ENTANGLED photons A and B -- one sent to ALICE and the other to BOB. The KISS scheme begins with a pair of PATH-ENTANGLED photons. This situation is difficult to visualize (because it's a quantum thing) but easy to produce in any modern optics lab. In the manner of Schrödinger's famous Cat, each photon takes two paths at once (path #1 and path #2) as long as you do not observe it. Furthermore, the path of Alice's photon A is perfectly correlated with the path of Bob's photon B: if photon A is observed to be present in its path A1, photon B will be found also in its path B1. FIG 2 shows a path-entangled photon source S, sending one photon to Alice on the left and a second photon to Bob on the right. Under certain conditions a photon that takes two paths at once can be made to INTERFERE with itself. To prepare for this eventuality, Alice has constructed an INTERFEROMETER by combining her two photon paths at a 50/50 Beam Splitter BS(A) and by placing a variable phase-shifter Q in path A1. To look for interference, Alice varies the phase Q of path A1. If two waves meet out-of-phase, they cancel one another, and no photons will be observed in Detector A3. In the other detector, waves will meet in-phase and all photons will be observed in detector A4. When the conditions for interference are met, Alice should be able, by varying Q, to vary the percentage of photons in counters A3 and A4 from 0% to 100%. On the other hand, when the conditions for interference do not exist, the photon counts at Alice's detectors are always 50% each, no matter how she sets phase angle Q. FIG 2 shows such a no-interference condition (called "the Fock choice", for reasons I won't mention here). Because Bob has chosen to measure which path his photons take, his choice forces Alice's photons to take definite paths as well. Since only a photon that TAKES BOTH PATHS can interfere, Bob's choice of what to look at absolutely precludes any interference on Alice's part. The gist of any purported FTL signaling scheme is to discover something that Bob can do with his two-path photon that will allow interference to occur at Alice's detectors. Fortunately this is easy to do. As long as Bob makes any kind of measurement that reveals which path his photon took, he destroys any chance of interference. On the other hand if Bob makes a measurement which ERASES which-path information, then interference at Alice's site becomes possible. The essence of the Kalamidas proposal is his discovery of a clever scheme that Bob can use for erasing his which-path information. The simplest way that Bob can erase his which-path information is to create an interferometer just like Alice did. 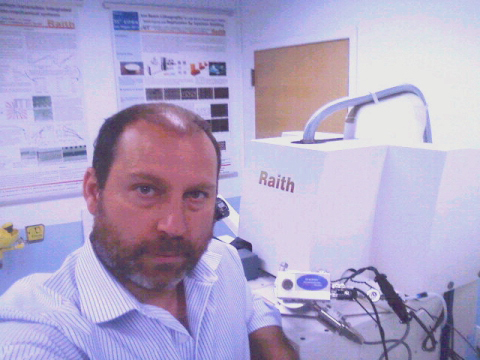 An interferometer combines both paths without prejudice. Once so combined, the question of "which path?" becomes meaningless. 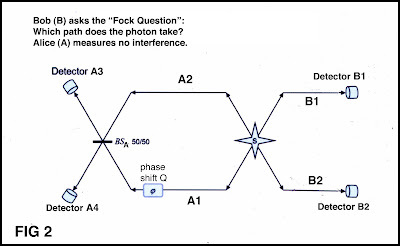 FIG 3 illustrates Bob's choice to measure his photon using an interferometer (called "the Frost choice" for reasons not relevant here). Bob's choice does indeed lead to measurable interference at Alice's detector, but there is a condition on this interference that precludes using this setup for FTL signaling. Bob's interferometer has two outputs, Detectors B1 and B2. If we just look at the output of B1 and what happens at Alice's detectors we observe a clear interference pattern P1. Likewise, if we just look at output B2, we see an interference pattern P2 at Alice's interferometer. However these two interference patterns, P1 and P2 are exact complements of one another, where one has peaks the other has valleys. The sum of P1 and P2 is exactly 50% in each of Alice's detectors, hence no interference pattern at all. This feature seems to be common to all putative FTL schemes of the path-entangled type -- that whatever interference pattern Bob's action creates at Alice's site will be exactly canceled by an equal and opposite anti-interference pattern. The genius of the Kalamidas scheme was that he had apparently created a way that Bob could erase his which-path information without creating a self-canceling anti-interference partner. 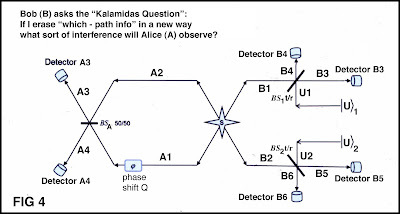 Kalamidas begins with the simple which-path setup of FIG 2, and, rather than erasing or recombining Bob's two separate beams, he "ambiguifies" Bob's path information by randomly adding photons from a synced external source in such a manner that for a certain output (labeled (1,1), it is impossible to say which path the photon took. Furthermore, this process is asymmetric: there is no partner anti-process that might produce at Alice's site a self-canceling anti-interference pattern. FIG 4 illustrates the "Kalamidas Choice". A mirror with reflectivity "r" is introduced into Bob's path B1. This mirror can add or subtract photons from Bob's beam. The added photons end up at detector B3; the subtracted photons end up at detector B4. The source of added photons is designated U1 which produces a single photon a% of the time; and no photon (100 - a)% of the time. Using this setup, there are many outcomes where "which path Bob's photon took" can be inferred. But there is one special outcome where we are left in ignorance. This is the outcome [1,1] where both B3 and B5 detect a photon. 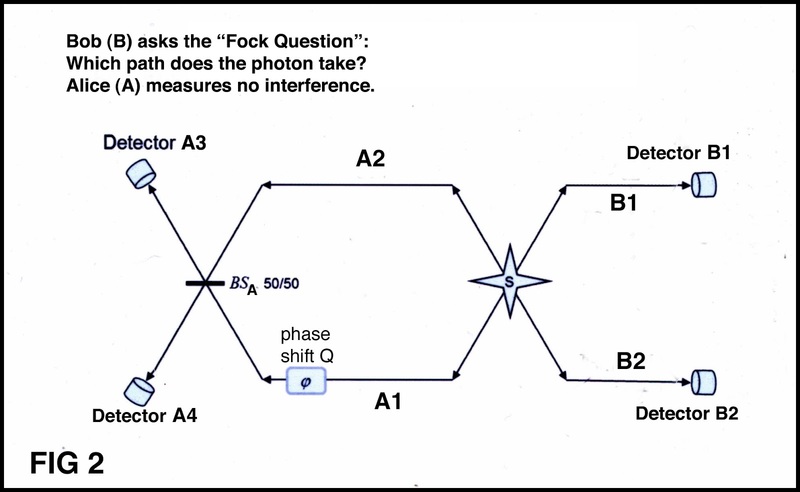 Did the real photon take the upper path and a "fake photon" take the lower? Or did the opposite occur? A simple physics calculation shows that this abiguification works. Whenever Bob observes the [1,1] outcome, a corresponding interference pattern appears at Alice's detectors. Furthermore, there seems to exist no obvious Bob outcome that could cancel out this singular effect. I will return to the resolution of the KISS paradox, but first I would like to pursue an amusing metaphor inspired by Kalamidas's clever and beautiful scheme. For each photonic event, Bob's two detectors can have several different outcomes but only four are important for this discussion. the outcomes [1,0]. [1,1], [0,1] and [0,0] where the brackets enclose the outcomes of detectors B3 and B5 thus [B3, B5]. Let's look at how each of these 4 outcomes might have been produced by the Kalamidas scheme. 1. The [1,0] outcome ostensibly represents TRUTH: one real photon ended up in detector B3. No "fake photons" were added. No "real photons" subtracted. 2. For the [1,1] outcome, one photon is "real", the other is "fake" (it came from the external U1 source, not the original entangled source S) but there is no way to tell which is which, so "which path" information is totally erased for this outcome. The [1,0] --> [1,1] is analogous to confusing an issue by deliberately adding "fake news". Suppose someone is claiming that certain towers were taken down by demolition charges rather than by airplanes. Instead of defending the airplane story, one can "muddy the waters" by publicizing a claim that the whole thing was "done by holograms". One of the features of the Kalamidas effect is that, by virtue of the partially-silvered mirror, a photon can be lost from a beam as well as added. 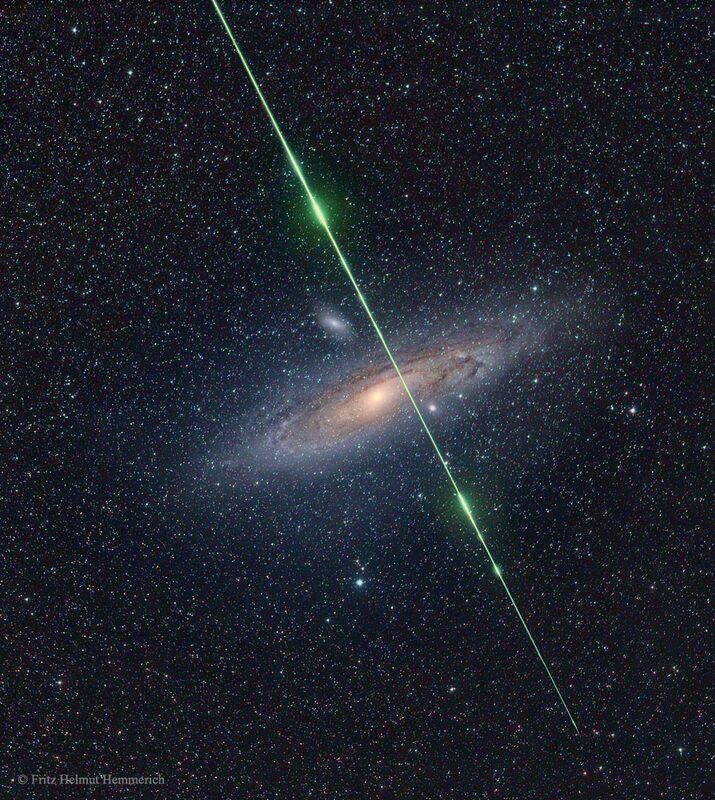 This can lead to the peculiar situation [1,0] --> [0,1] where a photon in the upper beam is incorrectly recorded as though it came from the lower beam. This outcome is produced when the upper mirror deletes the upper photon while the lower mirror adds a "fake photon". This complete reversal of the facts finds many an analogy in mainstream media which also employs both fact suppression and fake news oftentimes simultaneously. A common example is the fabrication of atrocities on the part of the enemy (fake news) while unreporting the atrocities carried out by "the good guys". I call this "switched news", in which the truth is the very opposite of what the media presents. 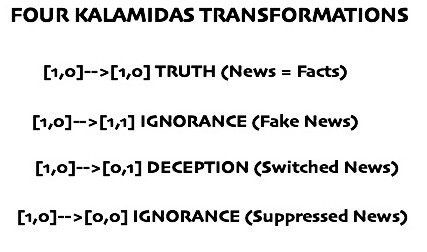 As it turns out, "switched news" is crucial to the resolution of the KISS paradox: what prevents Kalamidas's clever scheme from working? In the final Kalamidas transformation [1,0] --> [0,0], neither of Bob's primary detectors detects a photon. Whatever channel once held a photon, that photon has been censored, sequestered, quashed, hidden from public view, leaving no evidence of which channel it once occupied. In the media analogy, suppressing the true facts is a not uncommon way of conducting government business as the brave work of Edward Snowden, Julian Assange and many others has shown. "What never happened" never needs to be justified. Make no mistake, fake news, switched news and suppressed news is not confined to obscure photon physics experiments. 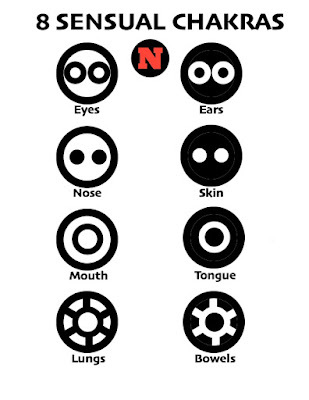 It constitutes most of what you see and hear on TV. And other media forms are not immune. Speaking of obscure photon physics experiments, we now return to the resolution of the Kalamidas proposal. 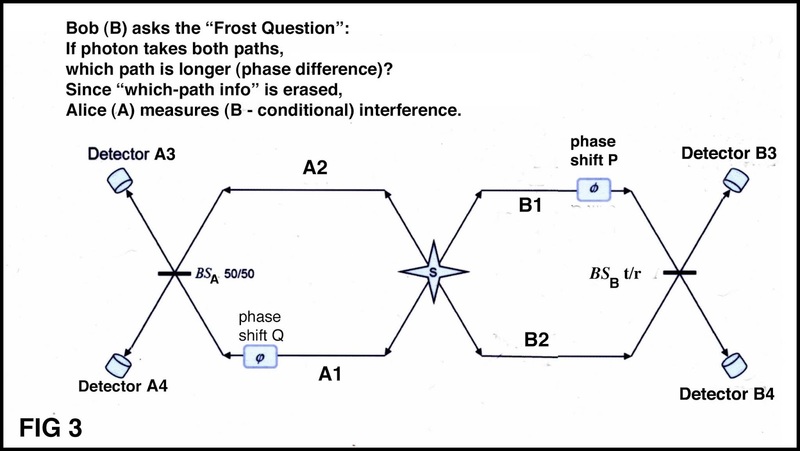 As it turns out, all three of these fake processes add enough ambiguity to the question of which path Bob's photon took that they produce interference at Alice's distant site. But where then is the anti-interference that usually appears to save the day in situations of attempted signaling using quantum entanglement? What exactly intervenes to prevent quantum time travel, humans messing with the past, and general disruption of the space-time continuum? You might imagine that the [1,1] result is balanced by the [0,0] result, but actually they produce the same kind of interference. 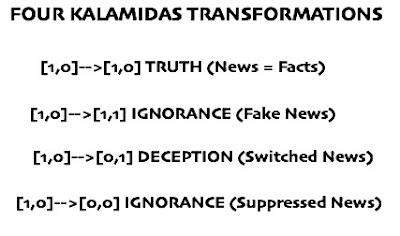 Instead, as calculated first by Martin Suda in Vienna and Nick Herbert somewhere in the redwoods, what cancels out the "fake news" and the "suppressed news", which act in concert, is (surprisingly) the "switched news" which produces equal and opposite interference at Alice's site. No interference. No signaling, FTL or otherwise. As illustrated by this calculation of interference at Alice's A3 detector as witnessed by my cat. Little landmarks on the skin. Protecting a thing thought useful called the brain. A NECK and THORAX without fail. What partners with the small of back? 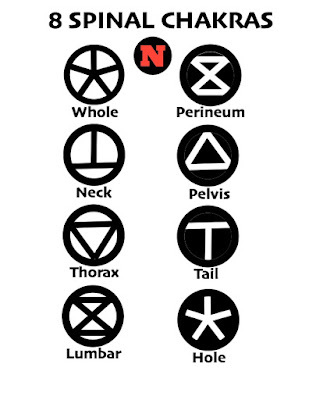 So LUMBAR and PERINEUM mate. 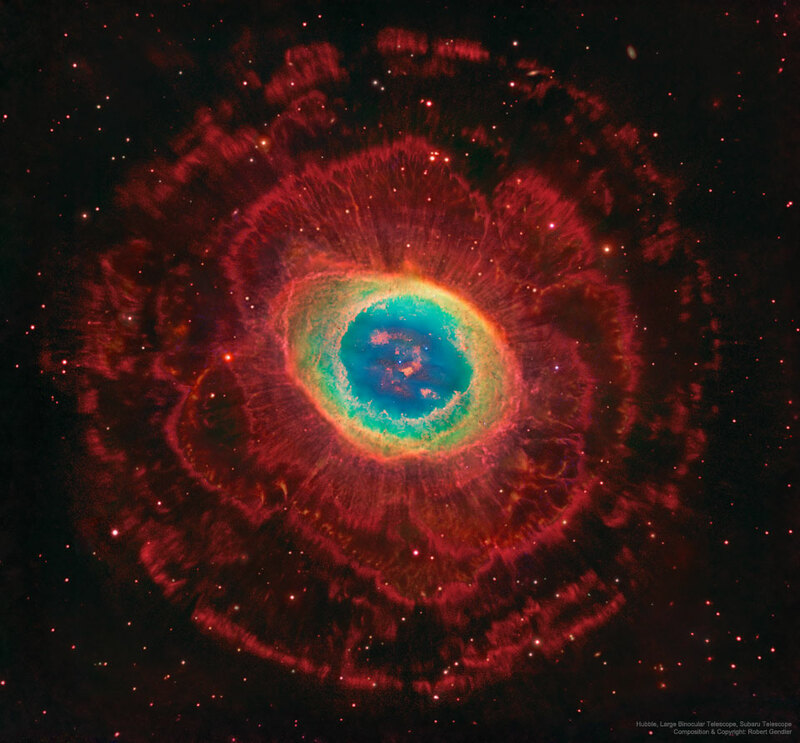 The Universe with a you-shaped HOLE. Some piggies even play Chopin. The joint of the WRIST. 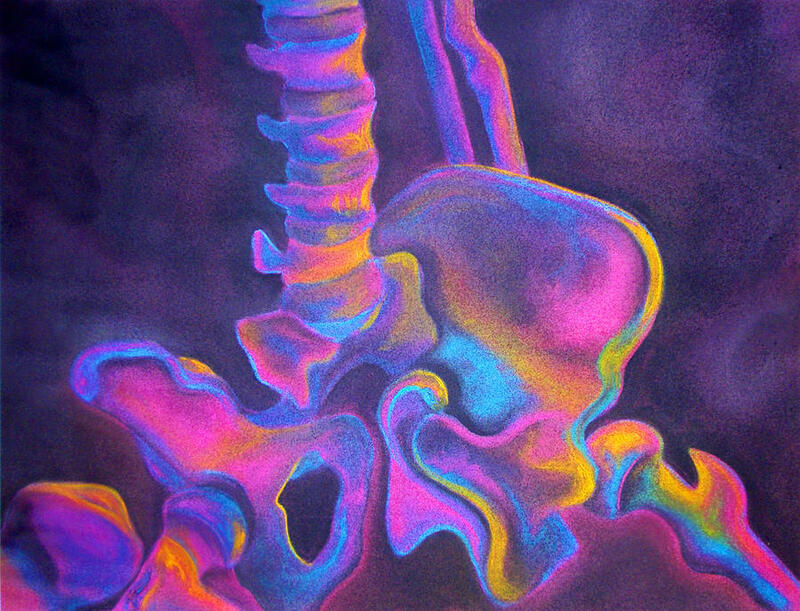 The joint of the HIP. Some piggies even live in Crete. While the CROWN connects you to mystery.